Kern’s Movie Credits Used to Build Floats!! 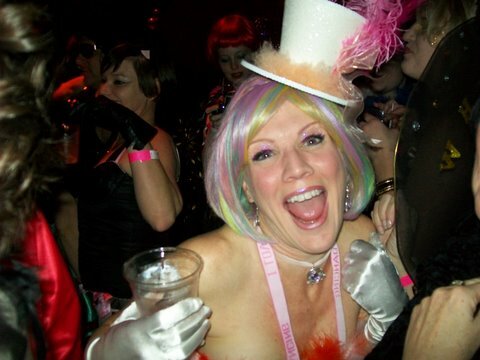 This is the second entry that goes on both my blogs- Watchopp and my Mardi Gras blog as well. We can thank the Legislative Auditor‘s office for this one, they released the report that the Kerns used the movie tax credits to build floats in 2006 instead of their unfinished documentary, Blaine Kern’s Mardi Gras: Building of the Greatest Free Show on Earth. 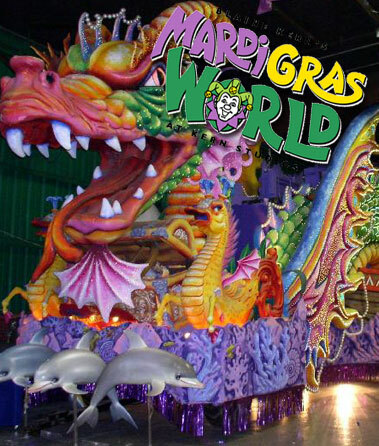 The Kerns own Mardi Gras World, a New Orleans institution. They build REX, Bacchus, Orpheus, Endymion, Muses, and Alla, among others. Barry Kern’s huge response to the Auditor report states that the practices the Kerns followed were somewhat widespread at the time among live entertainment documentaries that applied for the tax credit during the same time period. Those productions include Jazz Fest, Voodoo Fest and Essence Fest. That’s pretty esteemed company for the Kerns to be keeping. I guess French Quarter Festival kept their nose clean on this live entertainment documentary mess. Good for them!! Barry Kern thinks his dad, Blaine Kern Sr., notified the Legislative Auditor about the tax credit situation. That made Barry Kern very mad. If Dad’s objective was to make Barry mad, it worked. The Kern family is in the middle of well known legal battle for control of the Kern empire. Barry started the legal feud, and Blaine is doing his best to continue it. This is the juiciest, saddest public legal family battle we’ve seen in quite some time. My condolences to all involved. The big news in the case is at the end of February 2012, the Louisiana Appeals Court overturned the lower court and gave Kern Sr. back control. They threw out the deal the Kerns brokered with the key Mardi Gras Captains, and lifted the temporary injunction against Kern Sr.
That means the lawsuit, in which Barry Kern accused his father of ruining the company, will go back to Orleans Civil District Court for a full hearing. Barry Kern now has 14 days to appeal the ruling to the full Fourth Circuit bench for a rehearing. Otherwise, the case will be sent back for trial before Judge Kern Reese. So if the elder Kern is back running the business, why would he contact the Legislative Auditor and draw attention to the possible misuse of tax credits? To embarrass Barry for sure is probably the only reason. The elder Kern oversaw the building of those floats, not his son, more than five years ago. 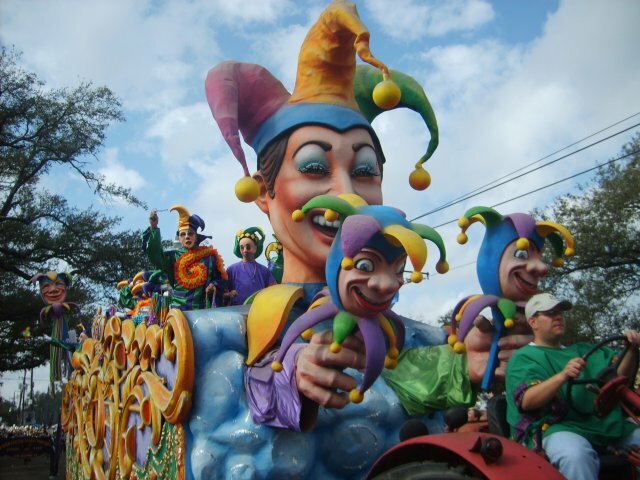 The Kerns’ movie was billed as a look at the history, design, building and production of Carnival and Mardi Gras floats, with a focus on the 2007 season, according to the Legislative Auditor’s report. The past year has seen a few upheavals in the topsy turvy world of Carnival. Blaine Kern Sr was knocked out of action by his son in the Louisiana Court of Appeals, you can thank Sr’s new bride for much of Mr Mardi Gras’ problems. It doesn’t appear that any of the Kern’s major Mardi Gras float building accounts have moved on. Rex, Bacchus, Orpheus, Muses, Alla, Endymion are all built by Kern enterprises for decades. Traditional Jester Float of REX, the King of Carnival! 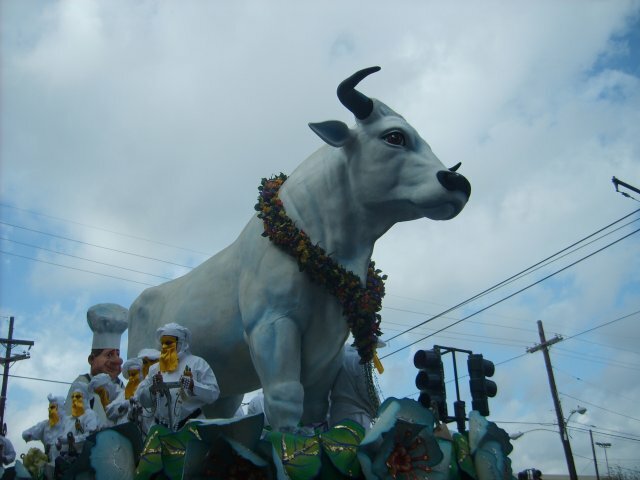 The traditional Boeuf Gras float of REX, the King of Carnival! 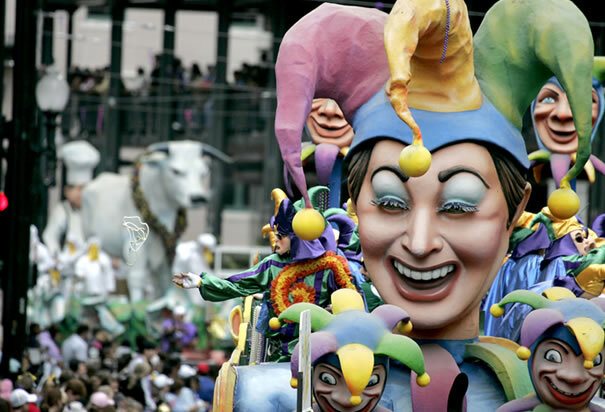 Jefferson Parish began the slow process of upgrading their parades. This is a very good idea, as their parades had slid considerably since Hurricane Katrina in 2005. For 2012, Gretna loses their most historic Mardi Gras Day parade, Grela, the West Bank’s only local celebration on Fat Tuesday. Gretna stopped funding Mardi Gras in April when officials had to choose between paying for Mardi Gras activities and giving money to the Gretna Heritage Festival. Yes, Gretna Fest has grown into a really nice festival, but Grela is Jefferson Parish’s oldest Carnival krewe. Gretna Fest has a huge budget with the dozens of bands that play the several day festival. They have corporate funding, charge a cover charge to enter the Festival, and sell a lot of food, drinks, and beer. They certainly could have covered the $30,000 much much easier than Grela could, and this is an obvious fact the Council should have seen a mile off. Therefore, a Carnival Jeer goes out to the Gretna City Council for backing the total wrong horse with this poor decision in April 2011. The krewe was founded in 1947 as a men’s club, but it changed its name to Grela, an acronym for Gretna, La. 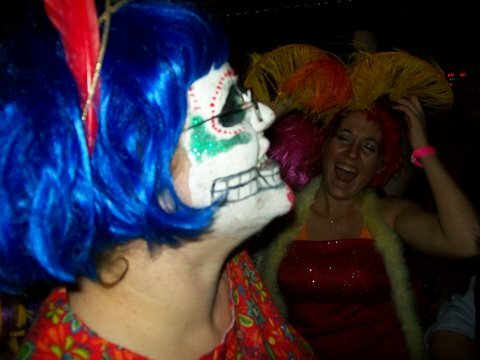 Earlier this year Rhea, another Jefferson Parish krewe, called it quits. Rhea was formed in 1969, making this parade over 40 years old! It began as an all woman parade, but became coed in later years. Rhea was the first Jefferson parade to roll down Veterans Boulevard, and the one of the few Jefferson parades to hold their ball in the Municipal Auditorium in New Orleans. One relatively new, local, and all male marching group, the 610 Stompers, marched in the Macy’s Thanksgiving Day Parade in New York City. Wow! The Stompers’ over the top dance routines flabbergasted Matt Lauer and Al Roker, it was a real New Orleans moment in New York City on national TV. They also appeared on the Hoda & Kathie Lee Show. That’s a lot of national attention for our homegrown group, and it’s well deserved! What makes these men so special is not only their uncanny ability to entertain crowds, but also the motivation behind the uniforms. What started as a plan to start an all male dance school to help pay for their Saints season tickets in their namesake section 610, has turned into an incredible medium to have fun while help others. Underneath those mustaches of manliness lie men with hearts larger than most. 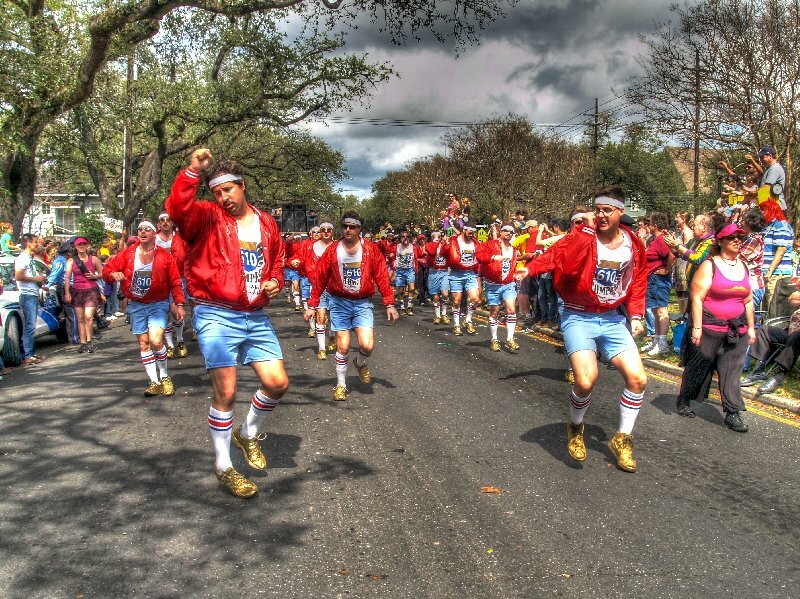 Since their formation in 2009, the 610 Stompers have raised and donated over $100,000 to charity. They were asked to be this year’s “Corporate Chair” of the Light the Night Walk for the Leukemia and Lymphoma Society of Louisiana and Mississippi, released a Stomp Out Breast Cancer video with Touro Infirmary, and have partnered with over 13 local and national foundations where their dance moves have helped those less fortunate. They have mastered having fun with making a difference. At this year’s 610 Ball they gave $610 to each of over 20 local charities, which at first glance doesn’t seem like a lot. However, these grants more often doubled the charities’ operating budgets making a profound impact on our citizens and local community. 2012 forecast will continue with part 3 in the near future. Once again, suing your aged dad, granted he’s under the spell of his much younger wife, never is a good idea. It doesn’t matter if you win in the Appeals Court, which the son, Barry, did. Karma works against you when you sue your dad, especially if he’s over 83 years old! The Kerns build REX, BACCHUS, ENDYMION, MUSES, ORPHEUS, ALLA, CAESAR, and many, many other parades around the metro area, region, and world. Therefore, lots of money and responsibility come with the territory, and the Mardi Gras crowds annually depend on the Kerns via REX, etc. A state appeals panel has upheld the court-ordered transfer of control over Blaine Kern Artists Inc. to the Mardi Gras magnate’s son, Barry Kern. The one-sentence ruling Tuesday denied the elder Kern’s challenge to an April ruling by Civil District Court Judge Kern Reese that enforced a father-son deal convected last year. That deal was intended to quell a family rift that threatened float production for a number of the largest Carnival parades. 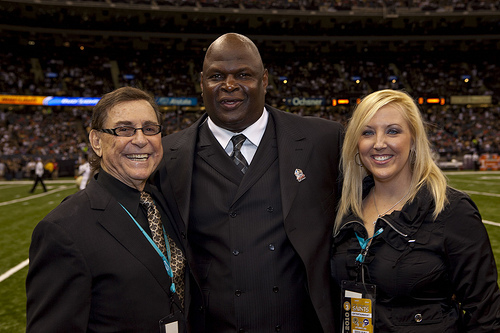 The deal, brokered by three prominent Carnival captains, called for Blaine Kern Sr. to sell all of his shares to his son and for the board of directors to turn over management control of the 54-year-old Mardi Gras giant to Barry Kern, 48, at a shareholders meeting. But Blaine Kern stood pat, and no such meeting or vote took place. At issue, Barry Kern argued, was the financial stability of the company. He twice filed suit against his father during the past year, saying the 83-year-old Kern Sr. had meddled with management and sapped its cash reserves. Barry Kern cast blame on his father’s fourth wife, Holly Brown-Kern, claiming his father’s spending on houses, cars and other luxuries had ballooned since his marriage to Brown-Kern, while his debt had mounted and he began seeking cash advances from the company. Blaine Kern’s attorney, William Wessel, could not be reached for comment late Wednesday on the 3-0 decision by a panel of the 4th Circuit Court of Appeal, finding “no error” in Reese’s ruling. In ruling for Barry Kern in April, Reese called the need to safeguard Mardi Gras “way bigger” to the world than a father-son rift. 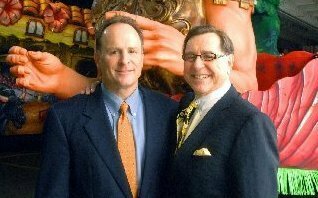 Under his order, the company’s four shareholders — Blaine and Barry Kern and Barry’s siblings, Brian and Blainey — met April 25 at Blaine Kern’s Mardi Gras World to elect three directors who, in turn, named Barry Kern president. BARRY KERN SUES HIS DAD AGAIN!! The most renowned and biggest Mardi Gras float builder is feuding publicly again. The family organization that builds Rex, Bacchus, Orpheus, Endymion, and Zulu, among other icon parades in New Orleans has their dirty laundry out for all to see. The son of famous Mardi Gras float designer Blaine Kern has once more filed suit against his eighty three year old father, this time claiming the elder Kern has reneged on an agreement they made in October. 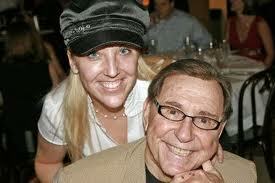 Barry Kern announced Thursday that he is again suing his father. Here’s the lawsuit. 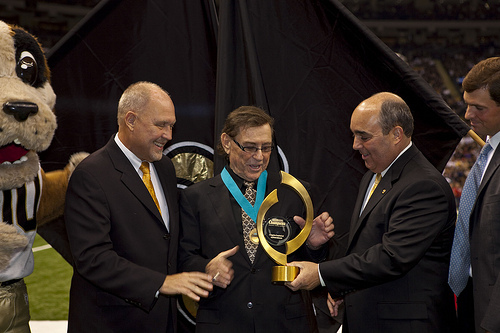 In the suit Barry Kern alleges that Blaine Kern has interfered with his son’s managerial control in several ways, including: firing his other son, Brian Kern; demanding payments for personal expenses; reducing a contract with a client that put it below the amount needed just to meet costs; and appearing at the cash register at Mardi Gras World, demanding cash. The original suit in October, 2010, contended that Blaine Kern had mismanaged the business, leaving it “technically insolvent.” Blaine Kern replied at the time that he had fired his son as company president for running the business into the ground. Blaine Kern said this evening he had not seen the lawsuit and could not comment.